During the Japanese occupation, most of the ambulances were appropriated and taken to Japan. “Canvas cars” were once again relied upon. ER: BAAG Report KWIZ #85, 9.2.45. “Increase in bus fares: Effective from today [15.12.44], the fares for the bus services in Hongkong and Kowloon have been increased, it was officially announced by the respective bus companies today. The revised charges are: Hongkong services: From Tunglowan to Pedder St – Y4 per person. From Pedder St to Western St – Y3 per person. The fare to Motohonkon [sic] remains unchanged. ER: BAAG Report KWIZ #70, 13.10.44. ” The bus service on the island will be resumed as from 18th August. In the forenoon, one bus will run from Causeway Bay to Aberdeen via Pedder St and Western St, and return. In the afternoon, the same bus will run from Pedder St to Aberdeen via Western St, returning to Causeway Bay. In the city area buses run to and from Pedder St and Causeway Bay eleven times a day. The fares from Pedder St to Causeway Bay are Y2.50 per head, and from Pedder St to Western St Y1.50 .” (BAAG Source Heung To Yat Po). “During the Japanese occupation, because of the scarcity of motor vehicles and diesel, wooden carts were heavily relied upon for the transportation of goods. There were a number of transportation companies using wooden carts, the larger scale ones having in their possession over 100 carts of various sizes. A large cart could accommodate 2,000 catties or more. They were so simple, and given the adverse conditions in Hong Kong during this period, must have been made here. I wonder where and whom? Fung Chi Ming adds: Regarding wooden carts and “yan lik fan bo che” which is Cantonese (The Putonghua romanization, official language in China, is: “ren li fan bu che” (in Chinese: 人力帆布車), which literally means man-powered canvas carts). This is mentioned in one of the wartime newspapers, details below. When I did a research on the HK rickshaw years ago, I found a lot of wartime newspapers. I kept many newspaper clippings. In the “Around Town” column of an English-language Japanese-controlled newspaper in HK during World War II, known as Hongkong News (dated 9 September 1943) there is a statement that goes: “In order to fall into line with Government’s policy of saving fuel and gasoline, the Health Department has temporarily withdrawn the use of the ambulance. Canvas hand-carts have, however, been put into use and the public should not be much inconvenienced by this temporary measure.” I didn’t carry out detailed research into the history of hand-carts in HK, but it seems that they were locally made in HK using local materials. As you said, they seem such simple machines, much simpler than rickshaws; they were probably made by the rickshaw makers’ shops. Fung Chi Ming has found the above 1942 photo, which may show a wooden hand-cart to the right of the right hand soldier’s head (photo taken from Cheng 2006). It is not however, as CM admits, very distinct. ER: I have found two more reports in the BAAG Intelligence summaries on the use of handcarts during the occupation. Michael Mabb (taken from Gwulo.com) : Having defeated the British in December 1941, the Japanese army used the golf club buildings until their own surrender in August 1945. The buildings (and the course) seem then to have lain derelict until 1949 when 1st Independent Field Squadron Royal Engineers arrived from Malaya and based a platoon in the spartan Fanling G C outbuildings (but at least there was a roof and windows which was a serious step up from living in tents). We built an airstrip on the 9th fairway to service the very light 2-seater spotter aircraft of the Royal Artillery who were to patrol the nearby Chinese frontier. This was not as drastic an operation as it might sound : we bulldozed out a few bumps and then laid a flat heavy steel open-mesh through which the grass continued to grow (it was not playable of course). 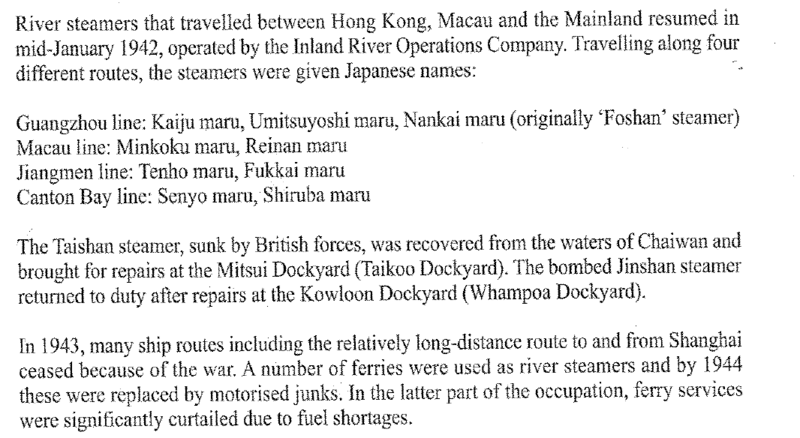 Agents reported the steamer ‘Fat Shan’ (which operated between HK &amp; Macao until sunk by a typhoon August 1971, killing many of its crew) was operating between HK &amp; Canton during the War. The ship belonged to the HK,Macao Canton Steamboat Co, was renamed NanKai 201 (South Sea). Name was later changed to Koto Maru (HK Island Ship). Sailings were advertised in the Hong Kong News. ER: BAAG Report KWIZ #75, 17.11.44. During the war years the Star Ferry was commandeered by the Japanese, and the Golden Star and Meridian Star were used to transport prisoners of war from Sham Shui Po to Kai Tak airport. In early December  two fire engines from England were being shipped to Hong Kong. However, after Hong Kong fell into the hands of the Japanese, they were shipped to Tokyo instead and stationed there to protect the Japanese Palace during air raids. After World War Two, they returned to Hong Kong again. All fire engines in the war had been painted grey. They were painted red again in 1947. 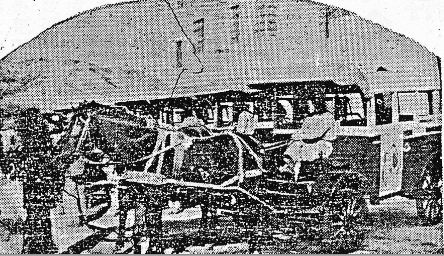 FCM: Here is a scan copy of Wah Kiu Yat Po dated 8 December 1942, which shows a photo of a horse carriage. This is the only photo of wartime horse carriages which I have seen. HF: (Notice at HK Heritage Museum) During the Japanese occupation the walls of Kowloon Walled City were torn down and the stones used to extend Kai Tak. January 23, 1944 (14th AF) Twenty-eight P-40’s and nine B-25’s pound Kai Tek Airfield in the Hong Kong-Kowloon area. LT: On Jan 16,1945 over 300 Allied Aircraft raided HK lasting from 0900 to 1800hrs. A couple of large armed junks off Kai Tak were damaged or sunk. On Jan 26 1945 during an Allied air raid [targeting various locations] Kai Tak airport was attacked, severely damaging the runway as well as destroying four aircraft. March 29, 1945 (14th AF) Fighter-bombers hit Kai Tek Airfield. 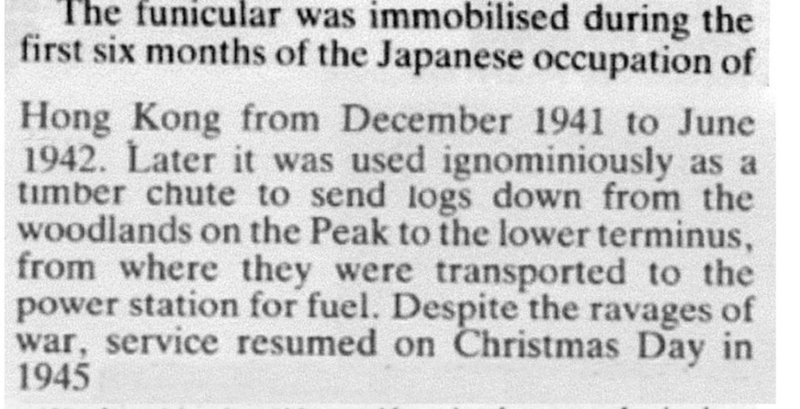 TM: During the Second World War, the occupying Japanese forces ran the railway (details of service are documented here). Following the announcement of the Japanese surrender on the 15th August, 1945, and the liberation of Hong Kong to the British Royal Navy on the 30th August, 1945, a formal surrender was undertaken by Major General Unekichi Okada and Vice Admiral Uitaaro Fujita at Government House on the 16th September, 1945. Work commenced immediately on the restoration of the Kowloon Canton Railway- British Section. In February 1942, train services were partially resumed. Not until two months later could people have access to Shenzhen. The Shenzhen-Guangzhou line was finished on the 8th January 1944 but was for military purposes only. Common people could not use the service. On the 10th June in the same year, people could take the train from Shenzhen to Cheung Muk Tau. There were two services a day. [By 1944] because of a shortage of fuel, there was only one train service on alternate days going to and from Kowloon and the New Territories. In addition, services were restricted to people who had “official needs” and with “written proof from relevant authorities” or people holding a “train pass”, who were then allowed to purchase tickets. From Tsimshatsui to Shatin-Y2.20. From Tsimshatsui to Taipo – Y4.00. From Tsimshatsui to Taipo Market – Y4.40. From Tsimshatsui to Fanling – Y5.40. The following has been extracted and slightly edited from the technical magazine of the Royal Air Force Airfield Construction Service who comprised the majority of the personnel in ‘Shield Force’ who were the first to arrive in Hong Kong after the Japanese surrender. The article is dated March 1946, but relates to events in September 1945. The general neglect extended to the Canton—Kowloon Railway, a most important communications link, and before even a limited start on the rehabilitation could be made, an engine and rolling stock had to be over­hauled and renovated. As soon as this work was completed, reconnaissance’s were undertaken which penetrated beyond the border. In this journey there are two tunnels, one being Beacon Hill 2,200 yards in length, and the party discovered that both had been mined by British Forces prior to the Japanese occupation. Severe damage was done to the tunnel linings, but temporary shoring had been effected by the Japanese. Consideration was given to the possibility of effecting further temporary repairs, but it was decided that a more comprehensive scheme was necessary and that in the meantime the service, though limited, must recommence as an operational necessity. Pressing forward with the search for wood, a reconnaissance party in a re-commissioned engine of the Canton—Kowloon Railway penetrated into the New Territories, which were still occupied by armed Japanese. Fortunately, the enemy were quiescent, and large stocks of wood were discovered at Tai Po and Fan Ling, twenty and fifteen miles out respectively. An incidental on this trip was that a chit given by the Chinese Communist Army troops allowed the party over the border to collect a number of abandoned railway trucks. However, a fuel supply was assured, and electricity production was maintained to Kowloon, but the margin was so close that on one occasion the power house was within fifteen minutes of closing down completely when the utmost effort brought in new supplies. A small supply of coal was located and a regular daily service was instituted on the 11th September 1945. This not only enabled fuel to be transported for CLP’s power station, but it also once again made transport available to the main supply sources for Kowloon of fresh vegetables. When Commando troops arrived at a later stage, the railway proved invaluable for transporting men and stores to their posts in the New Territories. It was considered necessary to survey the line through to Canton. A first attempt was made by road, but, after penetrating some twenty miles into China, the reconnaissance party had to abandon the project as the enemy had wrecked the road, bridges were unsafe, and armed Japanese soldiers abounded. A second attempt was made by air, and this time the line was found to be clear through to Canton. Ultimately, trains were got through to Canton, and now Chinese troops (Nationalist) are travelling through to Kowloon for transfer to Shanghai. RAF personnel in the railway workshops originally serviced two engines and 18 trucks and later a further 12 trucks and 6 coaches have been made available. “During the occupation. most motor vehicles were commandeered by the Japanese administration and sent to Japan. The administration explained that due to the needs of the military there were ‘naturally few remaining’ vehicles and ship for civilian use. A small number of trucks remained for hire by phone, at a rate of 25 military yen per hour. HF adds: The two paragraphs seems somewhat contradictory. “Most” appears to me to mean nearly all vehicles were set to Japan and yet the second paragraph seems to indicate a fair amount of vehicles remained for the general public to use. I wonder if it is possible to get hold of the number of vehicles involved, and their type during the different years of the occupation. And how many were still in HK when it was liberated? During the three-year-and-eight-month period of Hong Kong being in the hands of the Japanese, the severe lack of motor vehicles and constant traffic hold-ups made rickshaws the main means of transportation again. At that time there were over 500 on Hong Kong Island and over 300 in Kowloon. 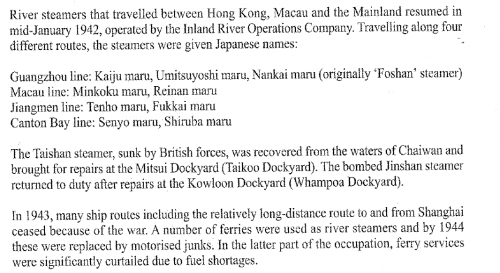 KCM: I found a Japanese document (in 1939) about the small Shirogane Maru (a steamer running between HK, Macau, and Canton before the war and continued during the Japanese occupation). The large Shorgane Maru (3,000t) that was abandoned in the South Pacific in 1942 was another ship. On the 1st October 1942, The Hong Kong Jidosha Umsho Kaisha resumed its taxi business. The company had twenty taxis serving on Hong Kong island and another twenty serving in Kowloon. Passengers had to telephone the company for service. HF: After the Japanese Occupation a very limited tram service was provided with only 12 tramcars in operation daily from Causeway Bay to Western Market. YHT: A tram ticket from the Japanese occupation overprinted with 10 sen. c1942. In 1945 at the end of the Japanese Occupation, all 109 tramcars still remained, but only 15 were operational. By October 1945 40 tramcars were back in service. The numbers don’t appear to add up. If only 12 trams were running post 1941 why were 15 still operating in 1945? HF: Adapted from Arenz, (see sources below). After the surrender of HK the trams were returned to their depots and all European staff were interned. At first loss of transportation was not a concern for the Japanese since they preferred people to be less mobile. However, a month after the cease-fire they realized there was a need to move food and supplies around. Notices were put up to get tram staff back to work. Food was a major encouragement. The workers received three catties of rice (about 4lb) per day in lieu of pay. Wages were later paid in Japanese yen. By 1942 only 60 trams out of the 109 were in service. As supplies dwindled it became more and more difficult to keep them going. Hong Kong Electric Company could not generate sufficient electricity and so for more four months the trams again stood idle. HK Electric started to burn hillside trees as fuel, enabling a very limited service to start up again. Only two routes were in operation. Causeway Bay to Whitty Street and Happy Valley to Whitty Street. As Hong Kong’s utilities became increasingly run down, resources became more depleted. Tram fares skyrocketed and routes shrank. Since spare parts were impossible to get, the number of serviceable trams had decreased to 15 by the time the colony was reoccupied by British forces in August 1945. The main tram depot had escaped direct bombing and no trams were actually destroyed during the occupation. However, though all 109 trams existed, only 15 could be operated and only 30 were capable of any kind of movement. All needed to be overhauled to some degree. The tram workshop had been turned into a factory making hand grenades during the occupation. On the streets the tracks were clogged with rubble from shelling and lack of maintenance. Overhead wires were sagging or badly worn in some sections. Others were broken or missing. Restoration began with the help of the Royal Navy which offered to get the electrical supply restored and in overhauling the trams. One member of the Royal Navy who assisted in this was Mr AE Jones who stayed on with the company after restoration, becoming Chief Engineer and retiring in 1966. By October 1945, 40 trams were back in service, but running only in the centre of the city. They could only be run in daytime as there wee no light bulbs. By May 1946 there were 50 trams in service and by August 63. More would have been running, but it took months for spare parts to arrive from England. 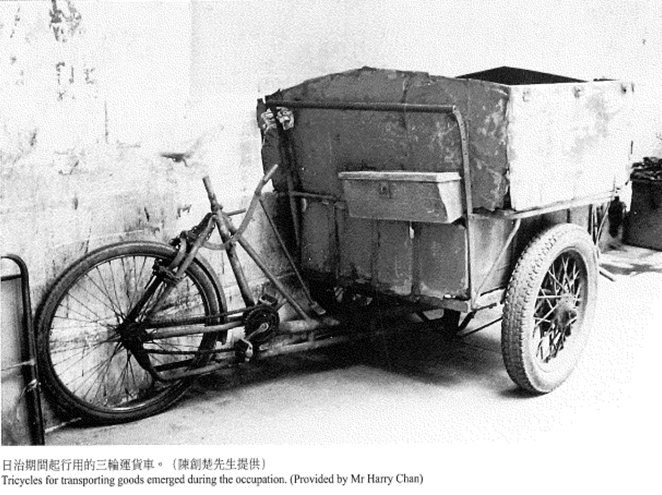 ER: This photo of a goods tricycle is taken from an exhibition of wartime Hongkong held at the Fung Ping Shan Museum some years ago. LT: Reports…said most of the tug boats were made to operate between HK &amp; Canton carrying troops in the main. Fung Chi Ming has found a photo , which may show a wooden hand-cart to the right of the right hand soldier’s head (photo taken from Cheng 2006). It is not however, as CM admits, very distinct. 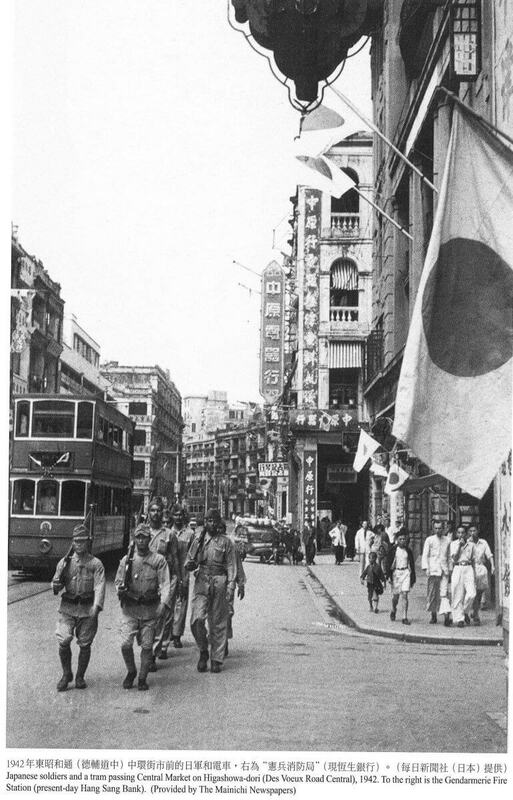 The caption to the photo reads, “Japanese soldiers and a tram passing Central Market on Higashowa-dori (Des Voeux Road Central), 1942. This article was first posted on 24th August 2014. The Index contains many articles about Hong Kong during World War Two. 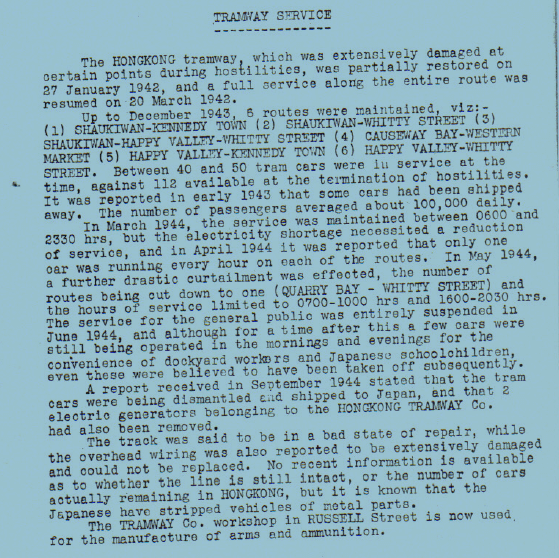 The 1945 BAAG Report fascinated me, as it mentioned that some cars were shipped to Japan during the Occupation. 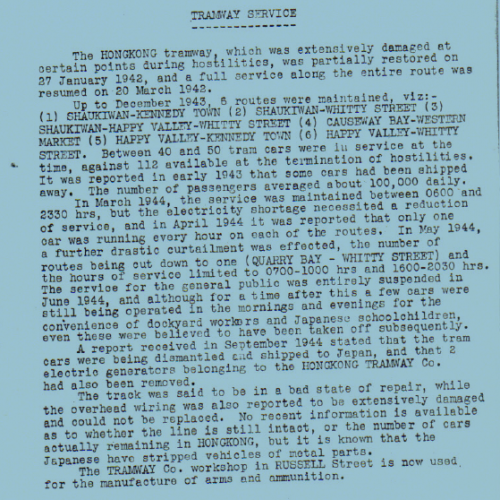 There is lack of accurate details on the actual number of cars in suspended service during the Occupation, probably owing to the connection breakdown due to bombing. I think the other proof to look back that period is the tram ticket, which I have added a couple of these in the new version of A&W book on HK trams. Joseph might like to know that tram fares in HK were reported in December 1942 as 3 cents to 6 cents (10 sen to 15 sen), and that since the devaluation of the HK dollar in July 1942 the only currency accepted on trams, buses and ferries was military yen. In addition to those overprinted tickets, the army had self-printed two version of tickets, first-class and third-class without fares.